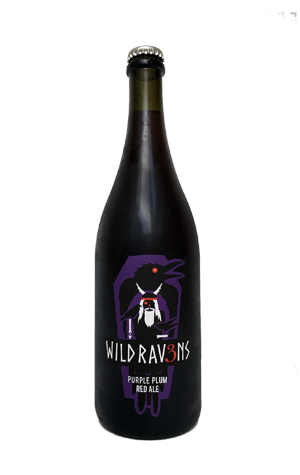 A few weeks ago, 3 Ravens unveiled a new line called Wild Ravens. One of many projects at the brewery instigated by head brewer Brendan O'Sullivan (who seems to be retrofitting gear or filling every available spare vessel in order to satisfy his long held passion for sour and mixed fermentation beers), it is to be a home for beers that have undergone various processes – such as souring, mixed fermentations, barrel-ageing – prior to release. First up was a rather tasty Old Brown and number two is the Purple Plum Ale. It's inspired by Flemish style red ales and, says Brendan, before release underwent processes including kettle souring, abbreviated fermentation, maturation in old wine barrels with lactic acid bacteria and wild yeast, and re-fermentation with fresh local Angelina plum juice. In your glass, that translates to a hazy, blood orange coloured beer with aromas that encompass tart and acidic, fruity (in a berry sense) and creamy butter biscuits. It's leaner and possesses softer carbonation than the Old Brown, with a cleansing acidity and a tart, drying, plum juice like finish. As it's bottle conditioned, they say its flavour will evolve over time; certainly, it's a different beast than an earlier sample we tried so will likely develop more complexity if cellared.